One of the most common bits of feedback we receive from Android users is that we don't offer enough free content for the Photo Editor by Aviary app. Well as of this week that has changed! We are proud to offer all of our Photo Editor by Aviary content packs for FREE to all Android users through the use of your Adobe ID. Where you previously had to pay for Effects, Frames, Overlays and Stickers you will now be able to download them at no cost when logged in with an Adobe ID. We will also be changing our content offerings on a rolling basis with updates to our Stickers, Frames, Effects and Overlays every Thursday. You can look forward to seeing more Seasonal, Cultural and Holiday related content in the coming weeks. Through the Adobe ID, users will have access to previously downloaded packs at any time. So as we cycle content in and out, the previous content will still be available to anyone who has already downloaded it. And don't worry, if you miss out on a certain pack one week there will still be opportunities to download it in the future. We hope you are as excited about this as we are! Download your favorite effects now! You asked, and we heard. You can now add beautiful fonts to your photos through our new integration with Adobe Typekit. Best of all, it’s free! See a 'Recipe' (stack of edits) by another user that you like on the Explore feed? Tap the 'Export' icon inside their Recipe. After you choosing a photo of your own, their edits will automatically be applied to your photo! Get a new perspective on your photos with our all new Transform tool. You can skew the perspective of your image both vertically and horizontally to get the exact look you want. Download the latest version on Google Play and let us know what you think! We are thrilled to unveil an updated Photo Editor by Aviary which includes two brand new sections: Explore and Profile. The Discover section as you knew it got a major facelift! Featured photos are now even easier to browse. Do you consider yourself a foodie? Sports buff? Nature freak? Animal lover? Good news! You can now explore a curated stream of photos based on your favorite category! Now you can publish your edit for a chance to be featured in the Explore section for the world to see. Better yet, every photo you publish gets saved to your Profile so you can have a collection of all your creative masterpieces in one place. If you publish an edit for your eyes only, make sure to mark it as private. Only public edits will be considered for feature. See a photo with edits that blew you away? You can now store your favorite edits from other Aviary users in your Profile for inspiration. Download the latest version for Android and iOS today and take advantage of our best Aviary yet! Time to test your editing skills with our new photo challenge. We want to see you use Aviary to creatively transform an ordinary photo into a masterpiece! Submit your entries by 2/16. We’ll announce the winner and repost the winning photo on Instagram on 2/18. Every year the Pantone Color Institute looks to trends in fashion, art, design and culture to select a Color of the Year. For 2016, they chose not one, but two colors that work together to create a sense of balance: PANTONE 13-1520 Rose Quartz and PANTONE 15-3919 Serenity. The warmth of Rose Quartz represents compassion and composure, while Serenity’s blue tones reflect calmness and relaxation. Together these two colors embody peace and tranquility. We teamed up with Pantone to create a special Effects pack that celebrate Serenity, Rose Quartz and their harmonious nature. These Effects are intended to give your photos a soft, ethereal glow. You can download it for free from our supply shop! Thank you to everyone who submitted their photos to our food-themed #aviarychallenge with The Infatuation! We had so much fun browsing through the entires and some serious bouts of food envy. We had a hard time choosing just one winner from all the awesome submissions so we reached out to our friends at The Infatuation for their expert opinion. And the winner is - drum roll please - Diem! We love how she created an Instagram mosaic by posting each section of her photo individually and how she used the #EEEEEATS Sticker pack to accent her photo. Take a peek at her Instagram page for more collages of delicious things! Congratulations to Diem and a big thank you again to everyone for participating. We can't wait to do this again! We love seeing all your #aviary photos on Instagram and Twitter, so we made a way to get your daily dose of photo inspiration right in our app! Tap Discover to explore a curated stream of beautiful photos made with Aviary. Tap and hold the photo to see the original, unedited version. If you want to dive deeper, press the play or recipe button below any photo to see the step-by-step editing process. New photos are added daily so you'll never be in short supply of inspiration! We hope that these photos spur your creativity. 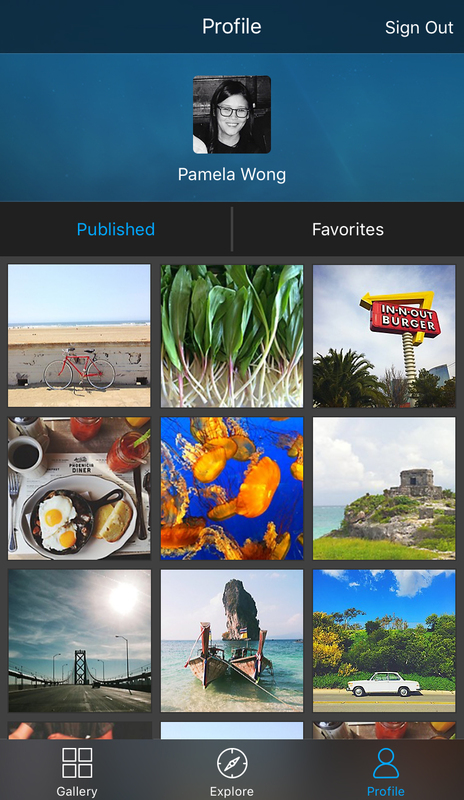 Update to the latest version of Aviary to try out Discover and get inspired! Using Aviary on Android? Hang tight, our Discover feature is coming your way soon. App Icon - Our old icon was bulky, over styled, and relied heavily on gradients. True to Material Design, our new icon has soft shadows and stacked elements to create dimension. The colors have been updated using the Material palette for a much cleaner and vibrant look. Tool Icons - We’ve also simplified the icons in the Tool bar. Gone are the strokes and drop shadows - we've replaced them with clean shapes and bold symbols. Tangible Surfaces - Every surface in the editor has been converted to a paper-like layer that creates depth and reacts to your touch with visual feedback. For example, tapping on a tool creates a ripple motion that mimics a drop of ink falling on a page, so you can see exactly where the interaction is happening. Print like Design - Material is heavily influenced by the foundations of print design, using imagery and color to create bold and simple layouts. In the new Aviary, accent colors are seamlessly integrated into your editing experience. Draw and Text tools pull color options dynamically from your photo, thanks to the Material Palette support library. Improved Supply Shop - We’ve added stunning transitions throughout the editor and incorporated cards to better organize our content. The Supply Shop now shows full bleed images for a simpler and more sophisticated browsing experience. Like the Draw and Text tools, the Supply Shop dynamically selects vibrant colors from the Material Palette library to complement the pack. Adaptive Design - Optimization across devices has always been a priority of ours. In this release, we've optimized the Supply Shop and detail pages so every aspect of the design remains consistent no matter what size device you’re using. We’ve also improved the performance of our app to provide faster and more efficient tools and image processing. Visit the Google Play Store and download Aviary now! This is just the beginning of a better Aviary. Over the next few months, we’ll be adding even more UI improvements, animations, and new features. If you have suggestions, feedback, feature requests, or just want to say hi, Tweet at us! And if you want an exclusive preview of future releases, join our beta group and help us make your favorite photo editor even better! You asked for a better way to organize your downloads, and we heard you. Now you can tap the pack image to expand, see all the supplies inside, then tap again to collapse. Gain easy access to your favorites with the new "Recent" folder. Any time you apply an Effect, Sticker, Frame or Overlay, they'll automatically be saved here. Swipe to the end of the tray and you'll find the "Manage" button. Tap it to drag and rearrange the order of your packs. You can even disable packs by tapping the "Edit" button. Changed your mind? Tap "Edit" again and the "+" button, or just simply drag the pack back into the "Active Packs" list. Download the latest version of Aviary on iOS now and let us know what you think! We've crafted the perfect starter pack with our most popular Effects, Stickers, Frames and Overlays. Whether it's adding a warm glow to your selfie or embellishing your food pics, we've got you covered with Aviary Essentials. And the best part? It's totally free with your Adobe ID! Sign in through the pop-up promo, or if you missed it, visit the Supply Shop. 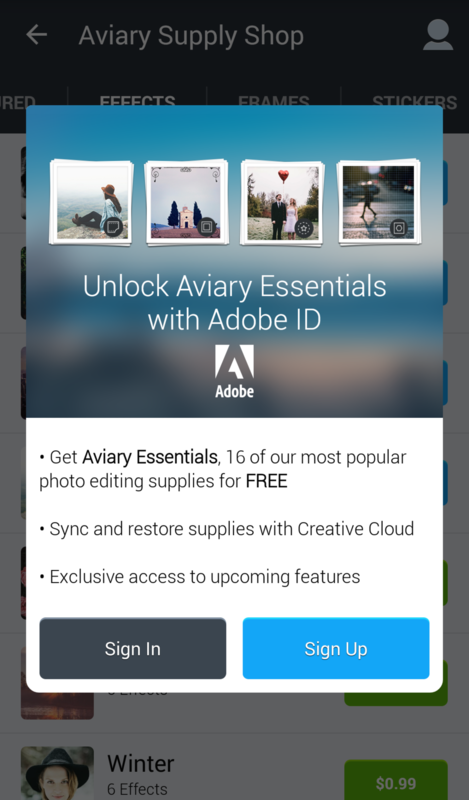 Get the latest version of Aviary to unlock Aviary Essentials!